Hope you tuned in when we warned you—it ended up being pretty great. For the first time since 1995, a women's U.S. Open final went to a third set, and it was a closely contested one at that. After breezing through the first set in only 34 minutes, Williams was turned back just as easily by Azarenka in the second, and narrowly avoided a tie-break in the third to win 6-2, 2-6, 7-5. At one point, Williams was two points from defeat in the match and was, over all three sets, only seven points ahead of Azarenka. Though she spent much of the day hitting flat-footed returns into the net—at points, it looked like she was fully wiped out—Williams dug deep and held Azarenka off at the end. In her post-match interview, Williams said of her opponent, "I really was preparing my runner-up speech, because I thought, `Man, she's playing so great,'" and it's not hard to believe her. This was technically an upset—headed into the final, Williams was ranked fourth, Azarenka first—but Azarenka was also 1-9 (now 1-10) against Williams lifetime, so whatever the recent history, it was a valiant effort. Our good friend (worst enemy) Darren Rovell pointlessly notes that Serena Williams has now become the first woman to reach an arbitrary number of on-court earnings, surely a fraction of her total wealth, which is also irrelevant to the win. Martina Navratilova more germanely noted that Serena Williams is catching up to herself and Chris Evert on the list of most women's Grand Slam titles ever; Williams now has 15, while Navratilova and Evert have 18 apiece. 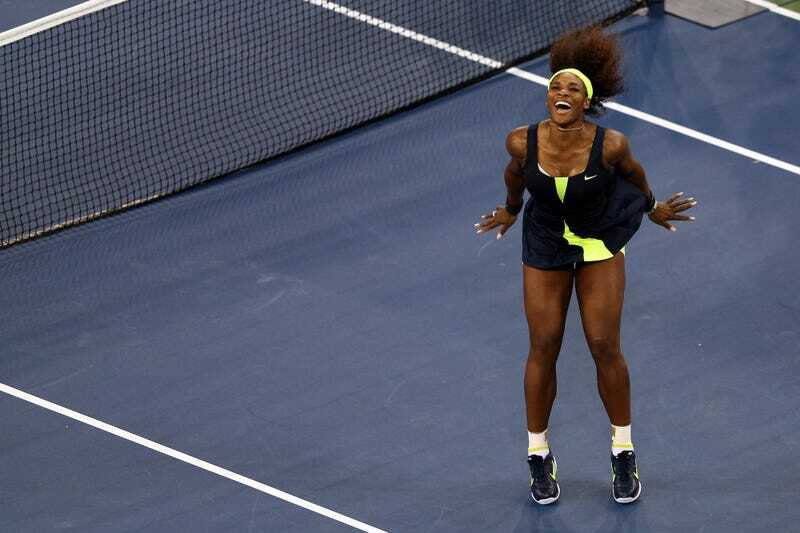 Williams did not crip walk in celebration, though had she, it would have been OK.